What is love? Not an original question surely, yet I do still ask myself this question. What does love look like? As a Catholic, my mind immediately turns to the crucifix; THE image of perfect love. Jesus, the son of God, nailed to an instrument of torture upon which he died to procure the salvation of my soul and that of all mankind. Gazing upon a crucifix is an opportunity for meditation, prayer and adoration. 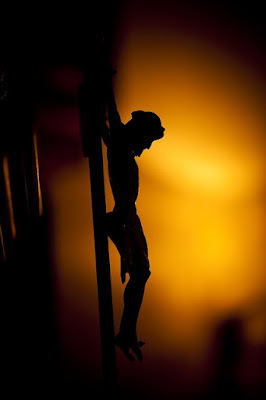 At times I suspect I romanticize the crucifix; so I’m going to put it aside for the moment. Because no matter how much in love we are with Love, God’s example of Love is not our natural response. Maybe everyone can identify with the challenge to love when a friendship sours. The situation I’m going to share, might evoke similar experiences in your life with the thought, “I’ve been there and done that.” Now think of two similar minded individuals meeting on mutual and equal terms – it is refreshing and leads to an immediate friendship. These two agree on numerous life essentials making it both satisfying and informative to delve into topics ranging far and wide. Their rare deviations in belief are easily borne. As time progressed, changes in my understanding of a few essentials occurred. Call it change in focus; call it growth in understanding; call it whatever you like, but with this divergence of our minds came a decided intolerance. Disagreements are now the norm; and interactions between us are onerous – feeling like an anvil strapped against my heart. [Anvil: made of iron and steel; shaped like upside down boot. The heel part is square and the toe part like the horn of a rhinoceros – it is very heavy, cold and painfully sharp] Repeat episodes of impatience and dismissive contempt cause emotional injury; and my furtive, wounded attempts to mend the relationship are ignored. My prayers for this person – whom I am unable to avoid – turn into petitions for their removal from my life. Any of this sounds familiar? Maybe it does and maybe it doesn’t; no doubt you beautiful minded, spiritually mature Seculars live your vocation with deep integration of heart. It’s obviously taking me ‘a minute’ to integrate holiness in my life. From the womb I came forth willful, passionate and sensitive of heart – character flaws my beloved parents tried diligently to help me overcome (still working on it). Simply put, when I am hurt it requires level-headed guidance and a concerted effort to work on that ‘call to holiness’. My long-suffering Carmelite ‘fratelli e sorelle’ using refined powers of suggestion, influenced my thoughts back to the evangelical counsels and the Beatitudes which I professed. Still the bitterness of rejection lingered in my complaints to God, but the Carmelite call to love did emerge from the fog, and with it came a particular grace. In pondering how Simon of Cyrene had the cross foisted upon him, it reminded me who ultimately carries our every burden. Then heaving a reluctant sigh of acceptance, I made a choice to love my estranged friend. Doing this means embracing the pain of that anvil with meekness and loving faith. My response was slow and very imperfect, but is a concrete opportunity to live in allegiance with Christ. It is a lesson about Love taught on the battlefield of everyday life. Gospel of St John 15:12 - “love one another as I love you” Jesus enters into his passion shortly after.